As yesterdays blog mentioned, Today’s (Tuesday) training was to be chaired once more by Hannes Siege. He gave his final presentation of this week which again was on the topic of competencies for ESD and when he finished he set a task for the participants in order for them to engage with what had been discussed on the topic. The task required them to split into groups and to develop a learning sequence using a chosen subject and relating this to some of the competencies set out in the presentation. The participants worked very hard on these sequences and afterwards presented them to the rest of the groups. This concluded Hannes’ input into week 7 but he will be back again in week 10. 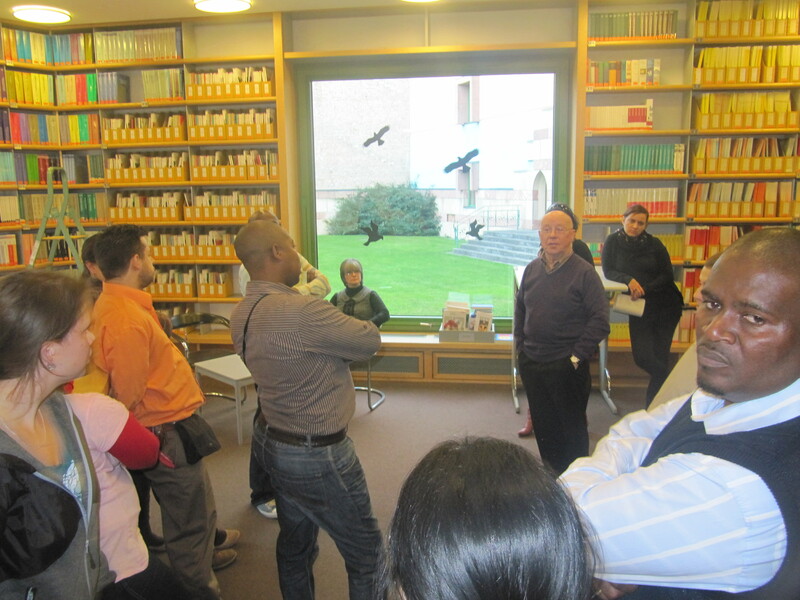 The group then traveled via the U-bahn to the Berlin Social Science Research Centre where they were treated to a tour by Prof. Dr. Udo E. Simonis who then went on to discuss with the group the work that went on at the centre. Here the group learned that it is the largest social science center in Europe (with the exception of Russia) and therefore is often visited by high profile guests such as Dr Dennis Meadows who visited the center last week. Different publications were then shown to the participants including a year book and discussion papers. They were also allowed to take the latter of these home with them. Time was then put aside for questions before Dr Simonis had to leave to catch a train. Amongst the questions was one from Jennifer regarding the issue of a sustainable economy which had been discussed prior to the field trip in Hannes Sieges’ presentation. This showed that the trip was very useful in showing the group the social dimension of ESD in reality and the intriguing questions show that the level of interest is high.